Growing up, I was the one family member that did not seem to fit in with the others. I was tall, the rest of my family short. I was blonde, the others either dark or red headed. I liked handcrafts, the others did not. I began to wonder if I had been switched at birth. I dreamed of a family of tall blondes from Sweden or northern Germany that were missing a child. Mind you, I loved my family, but this was always at the back of my mind as I grew older. I began to delve into family history at the age of 18. I figured I would settle the question of where I fit in, once and for all. As I perused the few papers and photos my parents and grandmother had, my doubts seemed to grow. Here were more dark haired and redheaded ancestors. Where were the blondes like me? Many of them, including the men, were quite a bit shorter than I. I kept looking for something, anything, that helped me to fit in. Years passed. I found many connections to my deep German heritage through various documents, but still, no one like me. I began to think I inherited the “odd” DNA. Maybe I was an aberration. That is, until the day I found THE PICTURE. I was gong through some of the old pictures we had found in a box from my parents house. PIcture from his side of the family that his mother had brought to the house when she lived with us. In this box were pictures of my father as a small child in 1920 and a picture of my great grandmother, a stoic German woman if there ever was one. 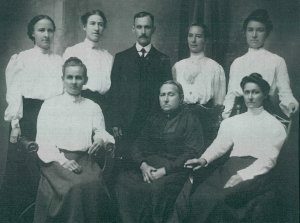 And there, at the bottom of the pile, was a picture of my grandmother’s family – my great grandmother, her only son, William, and her six daughters, Lina, Anna, Katie, Julia, Nellie and my grandmother, Tillie. I picked out my grandmother quickly. Then my eyes fell on her sister…she looked just like me! If I had dressed in the clothes of the time and put my hair up like hers (even though she is a dark blonde), you would have known we were kin! The DNA and physical characteristics were there. For this worried and budding genealogist, her fears were calmed and a sense of belonging was returned. You never know who you may resemble. Will the characteristics skip a generation? 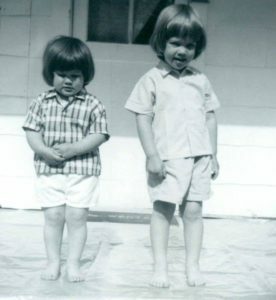 See if you can pick out which one looks like me below.